Summer is here. The season of being fried and boiled all at the same time. In Delhi, with temperatures reaching about 48 degrees, and increasing every progressive summer, it's like being zapped in a microwave. 'Tis the season to be grumpy and sweaty. 'Tis the season of drying, shriveled if not no fruits and vegetables. 'Tis the season where's there's no heavy chocolate fudge cakes. Fortunately, 'tis also the season of ice creams, sorbets, fro-yo, chilled fruit desserts, cola bars, orange bars, gelatos. And creamy chilled Creme Caramel. A sweet delicate mound of chilled creamy custard, in a pool of caramel sauce, flavoured with anything that tells you, "Summer's just 5 months long, enjoy the flavours!" 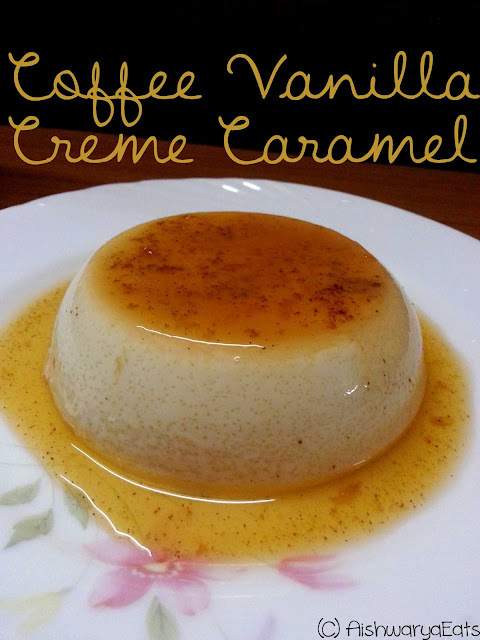 I made a Coffee Vanilla Creme Caramel this past weekend. It had that sweet brown smokiness of instant coffee, the creaminess of custard and the slightly bitter burnt caramel taste, pooled around it. Chilled till the bowl had these tiny droplets of moisture around it, and till the family could not wait any longer. They had threatened me with it for quite a while! The thing is, it's quite easy to go wrong with Creme Caramel. As I had tried twice previously, it's easy to have a strange blistered rubbery product, which, while it tastes perfect, the texture and appearance is way off. The trick is to have the presence of water, or steam. I have always been afraid of using foil as a cover in a microwave. I gave a leap of faith using microwave-safe cling film. It paid off, and how! 0.5 litres of milk, boiled and completely cooled. Full fat gives a creaminess, you can very well use toned also. 2-3 tsps of instant coffee dissolved in very little hot water, and cooled. Microwave safe cling film or foil. Make the caramel. Be very careful about burning it. Keep a constant watch, and pour it into the ramekins equally when it's at the golden stage, because it will cook as you pour it ans in the ramekin as well. It will take about 3-4 more seconds to reach the deep brown stage, and then its pretty much past its point. Let this cool and even harden. 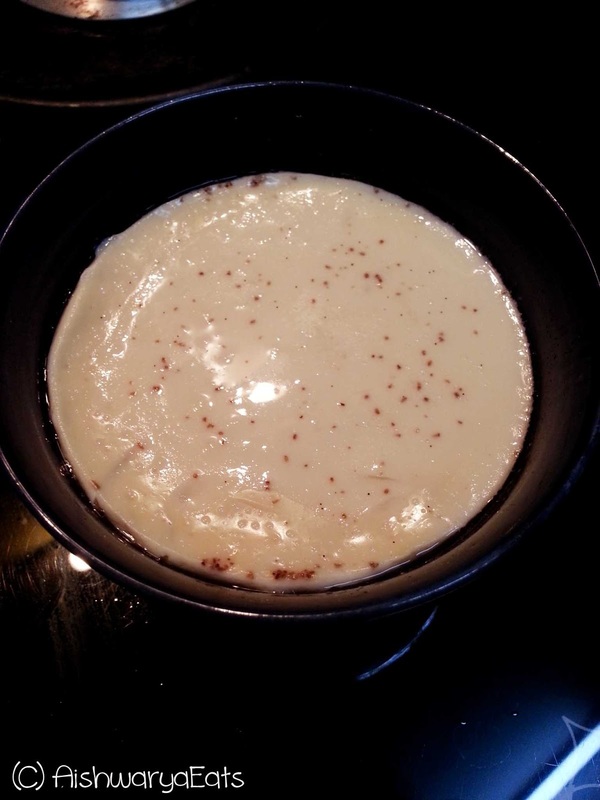 Whip the eggs one by one with the sugar till well incorporated and frothy in a completely dry and oil-free dish. Add the vanilla essence. In case you have some vanilla sugar at hand, add a dash of it for the speckly black vanilla particles. Add the cooled coffee solution. Mix well. Heat the milk till you can just put your finger in. Turn off the heat. Add the milk little by little. In case it has heated up too much, either cool, or put a bit of the egg mix into the milk, mix and add it back. Preferably add lukewarm milk. Mix like your life depends on it. Make sure there are no undissolved sugar crystals. Divide the milk within the ramekins. Now the most important bit. Wrap the top of each of the ramekins with cling film or foil if you are confident. You can cover with foil too. Or, as many websites tell me, we can put the ramekins in a roasting pan filled about halfway up with water. I used cling film. Bake them for about 25 minutes on the lowest or second-lowest setting on the microwave mode. When done, test just one. Let sit for another 20 minutes at least. Take it out and cool. Once completely cool, stick in the fridge to chill. It should look something like this. Just before serving, run a knife carefully around the edge if you feel it's stuck to the ramekin. Either way, invert over a plate. The runny caramel will pool around. This is one of the most sought after desserts in my family in the summers. Flavour it with anything, lemon (lemon rind and lemon essence), orange or pineapple (melt orange or pineapple jam till well liquefied), chocolate, caramel, anything. Just add it in place of the coffee. Retain the vanilla always for the foundation flavour. So that's it! Enjoy chilled, and let me know how it goes. 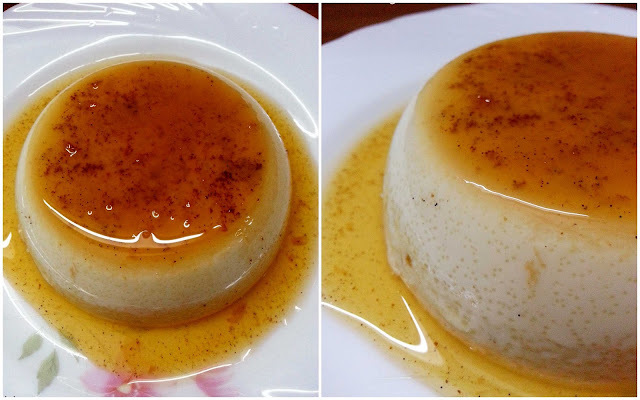 Nice to know the recipe of Coffee Vanilla Creme Caramel. I have never tried it before. I have made a coffee ice cream and it was superb. I wished I could share the recipe here. Anyways, thanks a lot Aishwarya for sharing about Coffee Vanilla Creme Caramel. Try this out, it's really easy, and super delicious. Thanks for stopping by! If you want to, please do join this site via Google Friend Connect.